painted while visiting Englandat age 33 by George Romney. The date was June 10, 1778. In the East, the Revolutionary War raged and Colonial forces under Gen. George Washington were seeing key victories producing a turning point in the conflict. People living in present-day Lycoming County, also were part of that war. They were fighting for their lives against an enemy and ally of the British, whose very plan of attack included ambushes and lightning raids designed to ignite as much terror as possible. Also according to plan, these attacks were creating a second front to drain men and material from Washington's fight. The land that would later include Williamsport had only one small settlement at Jaysburg (the modern Newberry section). But there was a problem with that location, and indeed any farms, forts and settlements west of Lycoming Creek, including those at the future towns of Jersey Shore and Lock Haven. They were on Iroquois land. At the Treaty of Fort Stanwix in 1768, the Iroquois sold the land east of Lycoming Creek to the English for 10,000 pounds sterling. The Iroquois were not selling land because they were cash strapped. This was a desperate move to take the pressure off of incursions by settlers onto the land of the Six Nations of the Iroquois in upstate New York. The Province of Pennsylvania threatened fines and imprisonment to those making “improvements” on Iroquois land, but to no avail. There were more than 2 million people bottled-up east of the Appalachian Mountains and the Colonials kept coming. And this, as it turned out, was not an Iroquois problem only. Despite actions like the British Proclamation of 1763, which forbade settling west of the Appalachians, all along the East Coast other Indian nations like the Cherokee were experiencing the same out-of-control invasion of their lands. Lt. William King was one of those illegally building a home for his family at Jaysburg. King had seen action as an officer in the Pennsylvania militia and, fully realizing the dangers of frontier life, he left his wife, Rachal, and their two children at Northumberland promising to come back for them when the home was finished. His wife, however, after hearing rumors of a pending attack by Iroquois and British up the North Branch of the Susquehanna, decided to join a group headed to Jaysburg. Just before dark the small band was approaching a wild plum orchard near the future Fourth and Cemetery streets in Williamsport when Indians attacked. In widening a path to accommodate wagons, settlers had piled branches from those same plum trees by the side of the road. It was a perfect place for an ambush. Some of the settlers escaped the tomahawk and some did not. Militia, dispatched from Fort Muncy to investigate the shots fired, saw some bodies at the scene, but decided to press on to Jaysburg, not being able to discern the identities of those killed because of the darkness. Lt. King accompanied the militia the next morning to the spot of the massacre. In all, six men, women and children lay dead. In one of the saddest moments recorded, Rachal who had survived the night despite her wounds, died after seeing her husband. His two children were missing and presumed captured. King, in all probability, had not known of his family fleeing Northumberland. The dead were buried where they fell. This was, in fact, the last of three separate engagements locally on that day in June and the death toll would be the highest war-death total in Lycoming County history. How and why had it come to this? Why did the Iroquois, who had never raised their tomahawks against English settlers, now kill indiscriminately? The Six Nations had stayed neutral in the French and Indian War and even in the face of the advancing flood of illegal settlement had shown remarkable restraint. At the beginning of the war, both Colonial and British leaders urged all Native Americans to stay out of the conflict. The attitude of the Iroquois was that the British did not need their help. They understood the British to be superior militarily. 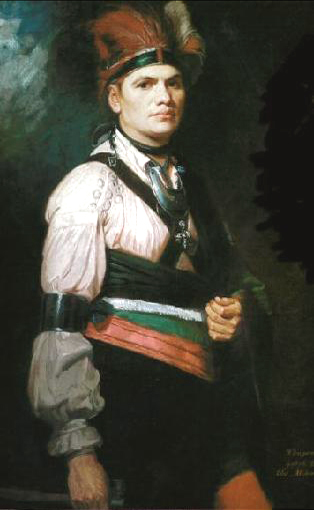 Joseph Brant was a Mohawk of the Six Nations. Brant’s sister married Sir William Johnson, a British Indian agent, and this brought several advantages to Brant including being educated at what would become Dartmouth College. He also traveled to England and was treated as a celebrity. His portrait was painted and while there he became a Mason. He also became convinced that the Iroquois needed to enter the war on the side of the British. At least they were trying to halt the aggressive settlement that threatened their existence. The Revolution had already begun when he returned to America, and after fighting with the British on Long Island he slipped behind enemy lines and returned to Iroquoia. Gen. Washington, meanwhile, had made a great tactical error in hiring Penobscot Indians to serve as riflemen (probably snipers). This enraged the British and the gloves came off. If the Iroquois or any other tribes wished to fight on their side then so be it. With great oratory, Brant spoke at the council fires of Onondaga, the capital of the Iroquois, and four of the Six Nations committed to the British side. The Tuscarora and Oneida stayed with the Americans. Sadly, the Great Iroquois Confederacy that had stood as one nation since before the coming of Europeans and that had been a model of government for the United States by our Founding Fathers, was now broken. The Plum Tree Massacre, and the ensuing Battle of Wyoming on the North Branch of the Susquehanna, would be the deciding factors in a call by authorities to abandon the West Branch. This would initiate a sad flotilla of settlers using anything including hog troughs and hastily constructed rafts to travel to the protection of Fort Augusta near present day Selinsgrove. This panicked exodus would become known as the Big Runaway. Settlers would try to come back to harvest crops and resettle for the remainder of the war but they faced serious danger from Indian and Loyalist attack. Most every home and fort in the area was looted and burnt. Joseph Brant would survive the war. He was granted 650,000 acres of land in Canada for his service to the Crown and moved there with other Mohawks at the close of the war. He became a farmer and continued to advocate for Indian rights. William King would remarry during the war and, in 1783 at the close of hostilities, he received news that his two children were indeed captured by the Iroquois and had survived. He retrieved them at Fort Niagara in New York and they would live out their days here in Pennsylvania. If you go to Fourth and Cemetery Streets in Williamsport you will see a monument to the massacre, and something perhaps unexpected. There are two grave markers behind the monument. Both are veterans of the Revolution. One of them is Lt. William King. I find it curious that he would be buried near the unmarked graves of the massacre. Was it guilt for not being able to defend his family on that June evening, or did he simply want to be buried close to his first wife? We will probably never know. Joseph Brant and William King were on opposing sides during the war. Both were brave warriors and both risked their lives defending a way of life and their homes in the wilderness.